Well, the short answer is, there is NO difference! If said in a straightforward manner, the contrast between a “Paintball Gun” and “Paintball Marker” is nothing but some letters and a matter of perception. There is NO difference there. The words allude to quite the same thing – an air-powered device that shoots pellets full of paint. So, there is no distinction other than a liking on what to call the device. When paintball was played for the first time, the devices that are used to shoot the paintball pellets were formally called paintball guns (because for all intents and purposes, they were guns – air guns). In the course of time, though, they also began to be referred as paintball markers. Markers are literally mean an object used to indicate a position, place, or route and in case of paintball, it is used to mark opponents and to eliminate them after marking them. However, paintball gun means gun, nothing else, a device that shoots colour pellets towards opponents in a paintball game. The story behind the shift goes as follows, though most of the information provided here is informal, so we recommend take it for what it’s worth. When paintball originally started it was generally played in the woods with players decorated in camouflage who would sneak around while trying to shoot each other. At one point, paintball boosters decided to detach themselves from this army-man variant of the sport and, with the growth of tournament speedball, an attempt was made to name the devices “Paintball Marker” that marks the enemy and it terms of paintball game, “Kill” or “Eliminate” the opponent. After the event of 9/11, there was a larger, industry-wide push regarding the more politically correct term “paintball marker” to further distinguish the sport from anything having to do with brutality or intimidation. In the following years, there are still those that only refer to paintball launching devices as “paintball markers,” but we have noticed a tendency back towards the name “paintball gun” in the orthodox lexicon. In just the past few years, most distributors that did mention the equipment as “markers” have, in most cases, got back to use the term “paintball gun”! 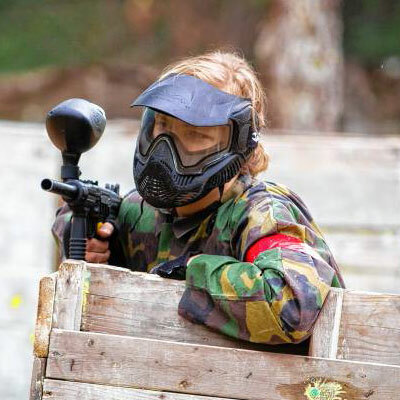 From the prospective of a paintball player, players normally refer to the device as a paintball gun, though sometimes they use the word marker as they want. While the term “marker” is a widely used name in paintball industry for a few years now, we don’t think that using gun instead of marker really alters the perceptions of the sport as most novice and non-players are simply mystified by the terms.